Seems obvious to you and I, but a fact that the Left has long resisted. Their response is always to indignantly insist, "...people want to work." But MSD doesn't necessarily agree. At least the actuarial arm which produces an annual Benefit System Performance Report. 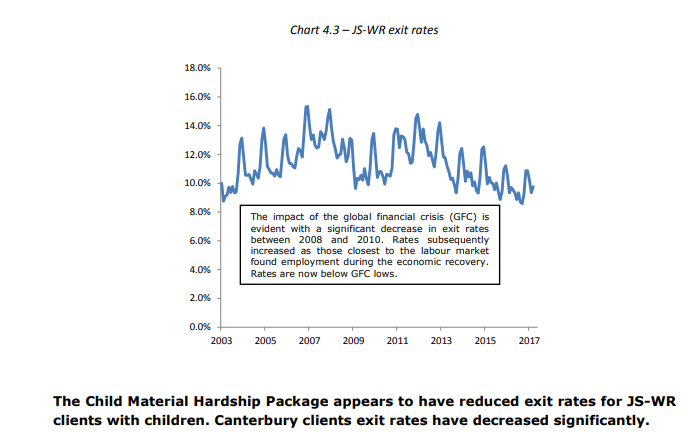 Below is a graph tracking exit rates among Jobseeker-Work Ready (JS/WR) beneficiaries. The associated commentary notes that recent exit rates are lower than during the GFC! But notice also the bold type sentence below the graph. 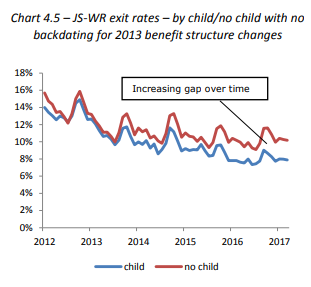 Paying those JS beneficiaries with children MORE has reduced their exits off welfare. 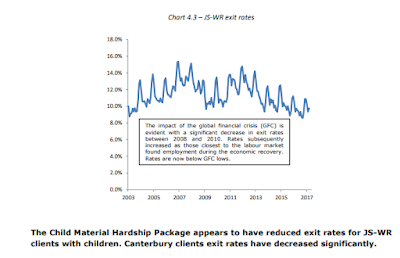 Establishing causality is difficult, though the widening of the gap appears to correlate with the introduction of the Child Material Hardship Package (CMHP) in April 2016. Benefit rates were increased by $25 for families as part of this package. Changes to the accommodation supplement from 1 April 2018 could have similar effects, although accommodation supplement is also available to low income families. It doesn't mention the significant increase to Family Tax Credits (including the Best Start $60 weekly baby bonus) from July 2018 but presumably the same applies. IRRS is more generous than AS and can act as a poverty trap. This means that Income Related Rents - whereby the state house tenant only ever pays a fixed percentage of his income - is a more generous subsidy than paying part of a tenant's rent in the private sector. The "poverty trap" describes what happens when the tenant is disincentivised to improve his income (through employment) because he will lose a substantial portion in increased rent. It's similar to the disincentive Child Support imposes. Not infrequently the two disincentives coincide. In previous reports we highlighted that the design of IRRS, AS and TAS creates financial disincentives for clients to move out of public housing and into the private market and employment. Yet greater generosity of benefits and other assistance is synonymous with the current government which steadfastly ignores that the associated disincentives come at a devastating social cost, particular to children. The socialist approach to alleviating poverty merely entrenches it.